A gravity knife is a knife with a blade contained in its handle, and which opens its blade by the force of gravity. As the gravity knife requires gravity or spinning motion to propel the blade out of the handle, it differs fundamentally from the switchblade, which opens its spring-propelled blade automatically upon the push of a button, switch, or fulcrum lever. The main purpose of this opening method is that it allows opening and closing to be done one handed, in situations where the other hand is occupied. A major historical use has been in issue to parachutists to cut off their parachutes when tangled in a tree or in similar situations. The gravity knife uses a button, trigger, or fulcrum lever to release the blade from both the open and the closed positions, and may use a side-folding or telescoping (out-the-front, or OTF) blade. While most military gravity knives utilize a locking blade design, other types may not mechanically lock open but rely instead upon friction to wedge the rear section of the blade against the interior of the handle. Factory-made gravity knives have various types of buttons, triggers, and fulcrum levers, which usually are used to release the blade from both the open and the closed positions. One of the most recognizable gravity knives is the World War II-era Luftwaffe Fallschirmjäger-Messer or German air force paratrooper knife, which utilizes a four-inch (100 mm) telescoping (OTF), gravity-propelled locking blade. First produced in 1937, the FJM was issued to German flight crews and paratroops, primarily for the purpose of cutting a trapped parachutist from his rigging in case he landed with a tangled parachute, or became entangled in trees with the shroud lines. Though not intended for use as a fighting knife, the FJM's blade could be and was used as a close combat weapon when necessary. The Luftwaffe Fallschirmjäger-Messer uses a sliding blade inside a metal gripframe, which was originally fitted with smooth wood scales, usually of beech or walnut. The blade itself is a relatively blunt spear-point, and the profile is flat ground, tapering to a utility edge. To open the blade, the user points the FJM downwards while flipping up the fulcrum-style operating lever, allowing gravity to draw out the blade to its fullest extent. Releasing the lever locks the blade into position. The FJM may also be opened by flipping the blade release lever while flicking the wrist holding the knife, causing the blade to extend. The FJM was also equipped with a folding marlinspike or awl. Primarily intended for untangling rope knots, it can also be used as a prying tool. The FJM's spike does not lock when opened and was never intended to be used as a combat weapon, though individual German paratroopers may have employed it as such. There are three principal types of wartime-era Luftwaffe Fallschirmjäger-Messers. The Type I FKm has wood scales (handle), was made from 1937-1941, and unlike successive models, has no 'takedown' capability. The Type II FKm is the same knife, but with takedown features, and was produced from 1941 to the end of World War II. After the end of World War II, the newly organized West German Bundeswehr placed new orders with German cutlery manufacturers for a postwar version of the FJM for issue to certain units of the West German army, including its airborne forces. The postwar FJM produced in olive drab and was stamped Bund (for Bundeswehr). The Bund FJM was made by a variety of contractors for the West German army, in three major types. The first is the Type III "trap door" gravity knife, made from 1955-1961. The second, the Type IV FKm, is very similar to the WWII-production Type II takedown knife, but features plastic polymer instead of wooden scales, and was made by WMF, OWF, or Eickhorn from 1961-1979. The third model is the Type V FKm, currently produced under the designation LL80 (1979–present). The LL80 is smaller, has fewer parts and is more cost-effective to produce than earlier Fallschirmjäger-Messers. A civilian version of this knife featuring a plastic polymer trapdoor handle, without marlinspike was also made. After British forces had captured numbers of the Luftwaffe Fallschirmjäger-Messer, the British government approached George Ibberson & Co. of Sheffield, England, a knife and cutlery manufacturer, and requested production of a British version of the German Luftwaffe gravity knife for the Special Operations Executive (SOE) and other clandestine warfare units. Under the initial wartime contract, George Ibberson & Co. made 500 gravity knives for issue to the SOE and other special forces. Two other manufacturers, both of Sheffield, Yorkshire, produced between 1,200 and 1,500 knives during the war. These Sheffield gravity knives had smooth wood or textured plastic scales, but were otherwise identical in features and operation to the Luftwaffe Fallschirmjäger-Messer, with a locking gravity-deployed blade, takedown feature, and a folding rigging spike or awl. In the hands of British SOE agents, the Sheffield gravity knife was considered to be a secondary combat weapon. In addition to the knife blade, SOE close combat instructors found that the folding rigging spike was useful for silent killing of sentries by opening the carotid artery on the neck. Some folding or telescoping knives that can open their blades by force of inertia or gravity were not intended or advertised by the manufacturer to do so. Knives that will lock their blades open, but do not have any closed position lock device are referred to as "false" gravity blades. The illustration shows the internal parts of a 1960s Japanese import 'false' gravity knife. Other knives may be considered to be 'false' gravity knives, including certain lock-back and linerlock folding knives that will not lock a blade in both open and closed positions. 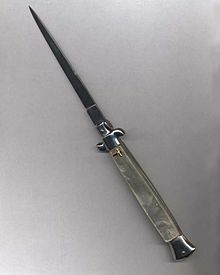 After the passage of the Switchblade Knife Act in the U.S. in 1958, it was discovered that some U.S. businesses were importing folding stiletto knives without spring mechanisms which did not have a pronounced blade heel (internal surface) in the pivot area allowing the longer 11 and 13 inch-bladed models to easily flick open. Modern (post 1965) folding stilettos imported or distributed in the U.S. now have blade heels that are intentionally pointed and ratchet against the lockback mechanism, preventing inertia opening. Other knives commonly mistaken for gravity knives include the automatic OTF knife, the switchblade and the butterfly knife (or balisong), the sliding knife, penny knife, and occasionally even common folding hunting knives such as the Buck 110 Folding Hunter. The 'conversion' gravity knife consists of a standard folding knife fitted with after-market modifications. The knife pictured does not lock closed, and is thus classed as a 'false' gravity knife. It can still be opened manually without touching the toggle switch. The addition of the toggle, which is attached to an internal bellcrank-arm, will lift the lockback mechanism to allow the blade to swing more easily. In some countries, such as the United Kingdom, Canada, and in certain U.S. states, a gravity knife is defined under the law as a prohibited weapon, with attendant criminal penalties. Other laws may criminalize the ownership, sale, importation, or carrying of a gravity knife upon one's person, either concealed or unconcealed. In the United States, some state criminal codes prohibit either the ownership or the carrying of gravity knives, either by name or by including a functional description of their opening mechanisms. Other state criminal codes bar gravity knives by redefining them variously as switchblades or balisongs (butterfly knives). Local jurisdictions including cities and counties may also restrict the ownership or carrying of gravity knives. In a few jurisdictions, such as Colorado and New York City, courts have periodically attempted to classify ordinary lock-blade folding knives with a blade that may be opened by centrifugal force (normally, using a flicking motion of the wrist) as a gravity knife, thus making the knife's owner subject to the same criminal penalties imposed for illegal possession of a gravity knife. The New York statute banning gravity knives has been declared "unconstitutionally vague" by the federal court in March 2019. Pantographic knife, often incorrectly referred to as a "Paratrooper Knife"
^ a b Langston, Richard (2001). Collector's Guide to Switchblade Knives: An Illustrated Historical and Price Reference. Boulder, Colorado: Paladin Press. p. 224. ISBN 1-58160-283-9. ^ Flook, Ron (1999). British and Commonwealth Military Knives. Howell Press Inc. p. 256. ISBN 1-57427-092-3. ^ a b c "AKTI APPROVED KNIFE DEFINITIONS" (PDF). 7 (2). American Knife and Tool Institute. 2005. ^ a b c d e f g Pattarozzi, Mack A. (2006), Luftwaffe Gravity Knife: A History And Analysis of the Flyer's And Paratrooper's Utility Knife, Schiffer Publishing, ISBN 0-7643-2419-5, ISBN 978-0-7643-2419-2: 'Takedown' refers to the knife's capability of being quickly disassembled into its component parts without tools. ^ a b Ladd, James D., Melton, Keith, and Mason, Peter, Clandestine warfare: weapons and equipment of the SOE and OSS, London: Blandford, ISBN 0-7137-1822-6, ISBN 978-0-7137-1822-5 (1988), p. 29: These British SOE gravity knives are NOT the same knives as the standard British Army soldier's and sailor's clasp pocketknife, which featured a short, thick marlinspike. ^ a b Muldoon, Gary (2006). "Is Butterfly Knife a Gravity Knife?". 5 (4). Conflict Defender Office, Monroe County, New York. ^ "Knife Laws" (PDF). Retrieved 4 July 2013. ^ Blackburn, Roger. "Colorado Knife Laws". KnifeUp.com. Retrieved 4 July 2013. ^ Campbell, Jon. "How a '50s-Era New York Knife Law Has Landed Thousands In Jail". Village Voice. Village Voice. Retrieved 7 October 2014. ^ "Federal Judge Rules New York's Dumb 'Gravity Knife' Law Is Unconstitutionally Vague". Reason.com. 2019-03-28. Retrieved 2019-04-13. This page was last edited on 13 April 2019, at 05:08 (UTC).